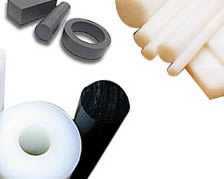 Nylon 6 also known as Polyamide, is characterized by a combination of high strength, toughness and abrasion resistance and is ranked as an Engineering Plastic. This is because of its unique balance of mechanical, thermal, frictional and chemical properties. Nylon behaves in a predictable, reproducible manner under load and in known environments. Engineers and designers are looking to nylon as a substitute for design material such as phosphor bronze, gunmetal, cast iron, copper, aluminium and the entire family of steels. Nylon is well accepted for several engineering applications. It is tough and hard, with good mechanical properties, high resistance to abrasion and impact and low friction properties. 6mm to 9" diameter in standard lengths of 300mm, 1000mm, 4 ft., bigger cut to size & roll lengths.